A firm roll, made of high density quality foam. Aids in the reduction of lower back pain and stress. 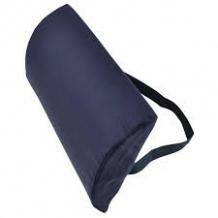 It can be used while sitting or lying down and includes a strap that holds the roll in position. Comes with a washable and removable poly/cotton blend cover. Select from firm or medium.